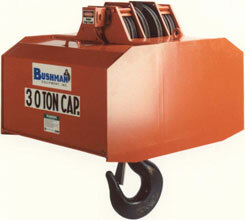 Bushman Equipment, Inc. hook blocks, often called crane blocks or crane bottom blocks, are below-the-hook crane lifting equipment designed for your specific application. 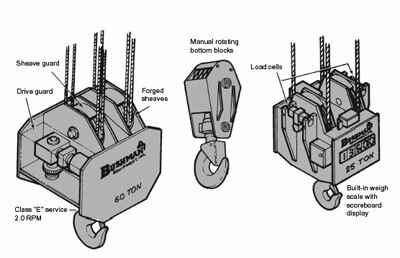 Sheave configuration, capacity, special control requirements and unique reeving patterns can be incorporated to improve your industrial lifting equipment operation. Right: Power-rotating hook block. Our blocks are available with an optional digital electronic weigh scale system. 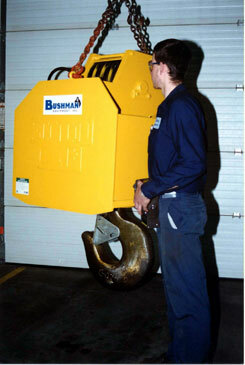 The motor driven 360° rotating crane hook block permits the crane operator to use an overhead crane to position heavy or awkward loads in less accessible work areas. They can also be equipped as motorized rotating crane hooks. 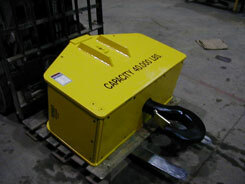 Standard non-motorized hook blocks are available for retrofitting or modernization projects. These crane blocks can also be manufactured in larger quantities for new crane installations. All Bushman Equipment, Inc. hook blocks are designed and manufactured in accordance with CMAA and AISE specifications and the latest revision of ASME Spec. 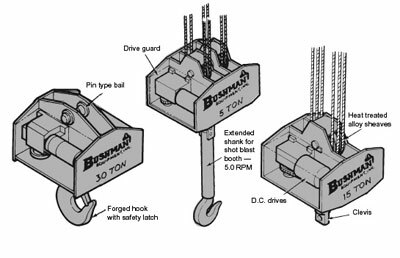 B30.20 and BTH-1: Design of Below the Hook Lifting Devices. These units are custom designed to your unique requirements.